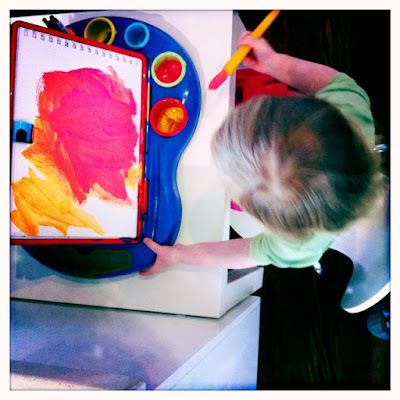 Bubby Makes Three: Make a Mini-Chalkboard! Following on from Friday's post about my caper into "busy bag" making , I thought I'd share what I got up to over the weekend with you. 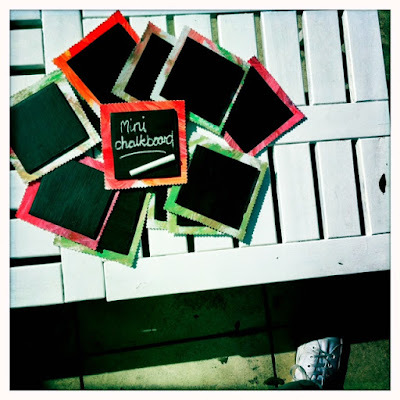 I'm not sure how or why I came up with the idea of making mini chalkboards; it certainly wasn't an activity highlighted on any busy-bag website I came across. For this reason, I really had no idea how I was going to do it! A google search produced several how-to sites suggesting making the boards from plywood which was a good idea... if I knew how to cut such a thing! Amanda came up with a great suggestion to paint the inner cardboard of those cheap and cheery Ikea frames you get in little packs of two -- another great solution which would have worked a treat except I live an hour away from Ikea. So I hit the $2 store. As you do in desperate situations! And as always, I came up trumps. I came away with a packet of mounting boards and some art canvas paper which I decided was the quickest and easiest way of making my mini-chalkboards. I already had a tin of chalkboard paint at home. 4. Once paint is dry, glue your chalkboards onto the cardboard. 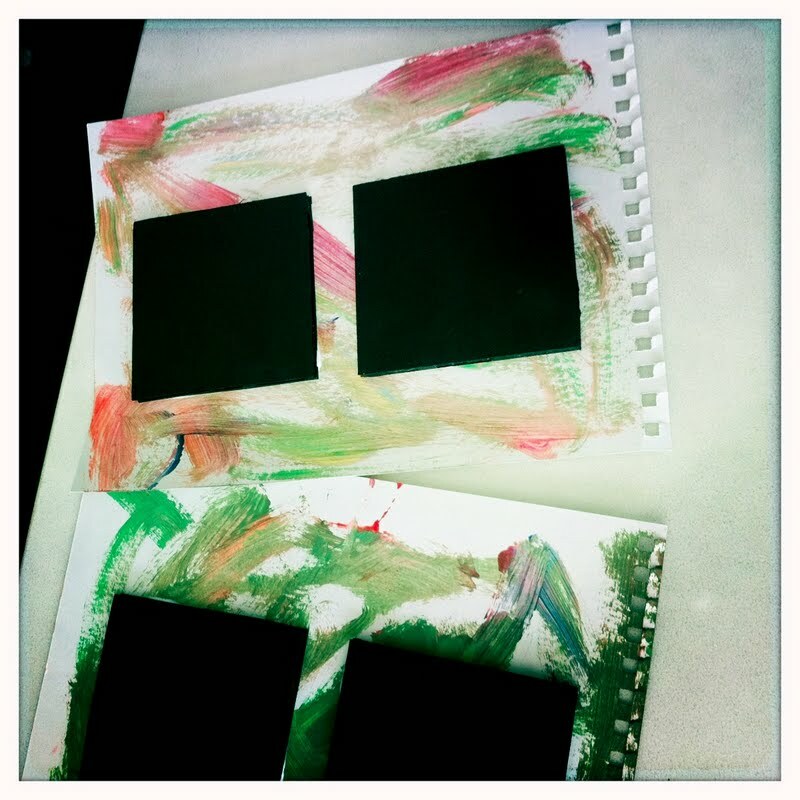 Using your scissors, cut around the chalkboards so you create a little "frame". I used a zig-zag but you can use whatever decorative scissors you like! 5. T-daaaaa! Instant arty MOBILE fun at your fingertips whenever you need it! Great for the car... on a plane... at a cafe... and so on. Our busy-bag "swap" is this evening -- tra-la-la-la! Look forward to hearing how tonight goes. 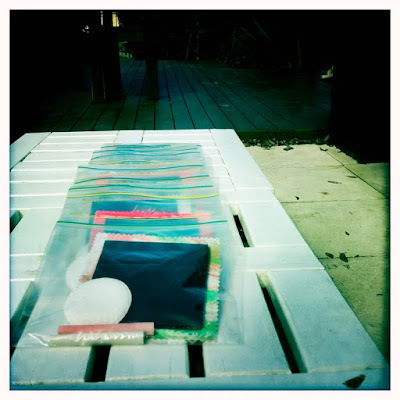 oops, a bit new to blogging other people's pictures and I just popped yours on my blog (with a link). Hope this is ok, please let me know if not and I will take them down (and ensure I ask before next time).